Following the success of our training days, we are starting a new kind of meeting which we hope will interest all needleworkers! If you're like us, you have at least 10 (or maybe more like 100) unfinished projects languishing in a cupboard taking up space and giving you pangs of guilt every time you open the door and see them. Could do with a bit more work. Join us on our project finishing day! We will meet at 10am on Saturday, 28th June 2014 at the church hall of St Anthony of Padua, Headington, Oxford OX3 7SS. 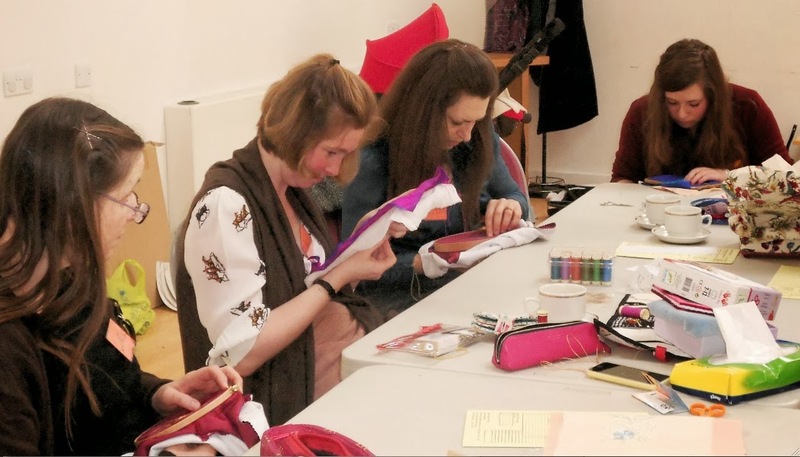 There will be people there with a wide range of skills and experience to help and advise you; it will be the ideal opportunity to make progress on your neglected work, whether it's hand embroidery, dressmaking, quilting or something more exotic! To book, email Lucy Shaw at lucyashaw@gmail.com . Places cost £15 each - all ages are welcome. 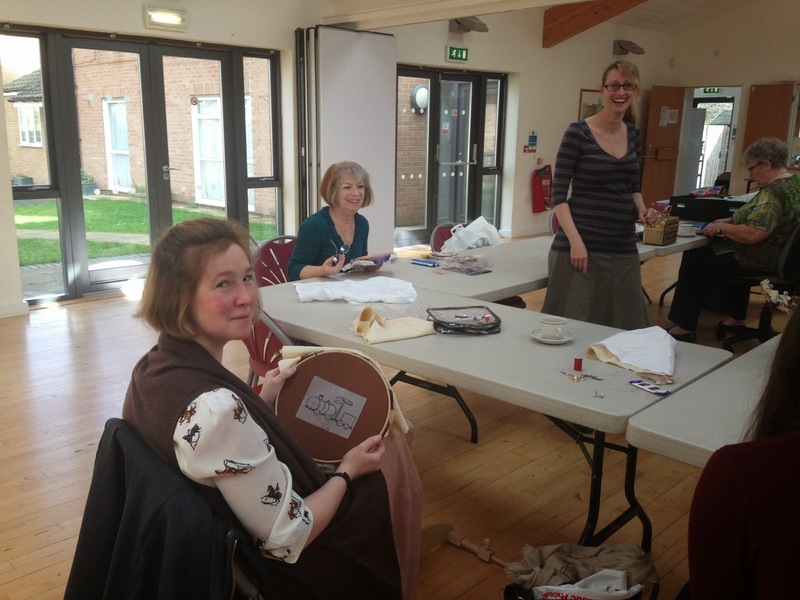 On 22nd February we had our Goldwork Training Day, led by Sarah Rakestraw and Sue Hinde from Golden Hinde goldwork supplies. We all chose a design, originally created by Sarah, and used different techniques to outline and fill in. This is the design I chose - a simple flower. 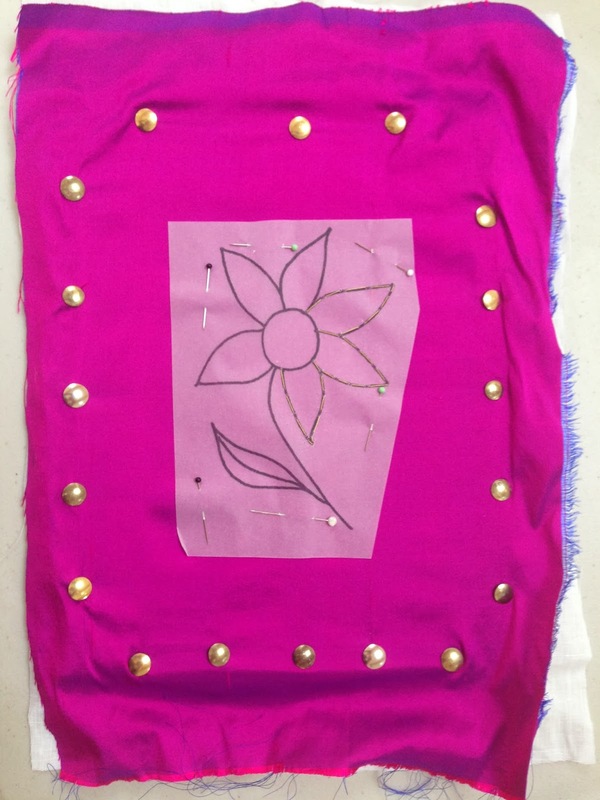 The design is marked on tracing paper, then tacked on to silk dupion which has been mounted on to an embroidery frame. Then the tracing paper is carefully removed, leaving the tacking stitches behind. 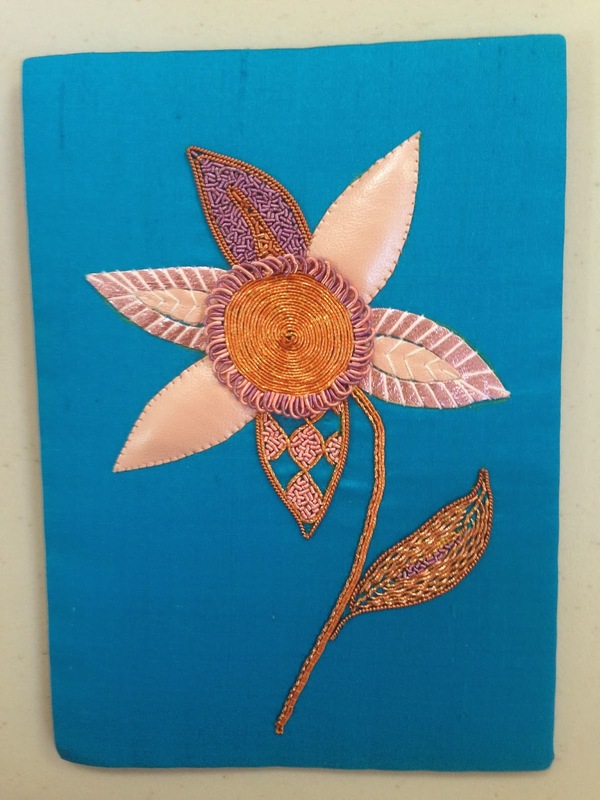 We learnt beginner's goldwork techniques: couching, leather work and beading. 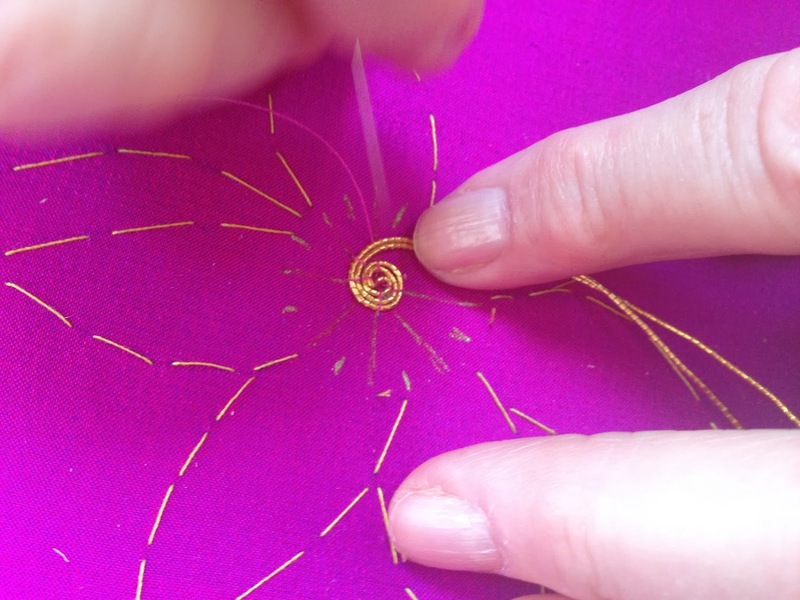 However these are staple techniques for goldwork: most of the more advanced techniques simply build on them. Sue demonstrating couching. 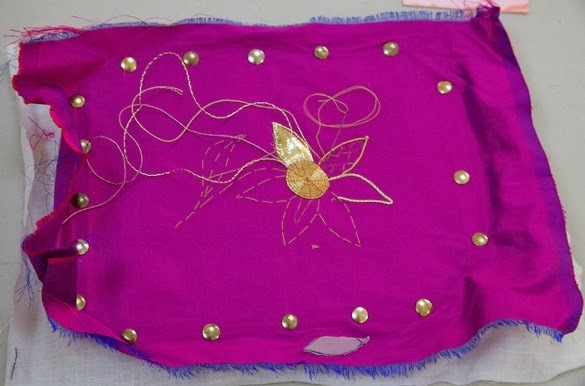 The stitches which overlay the gold threads, holding them to the fabric, form a pattern which are part of the design. 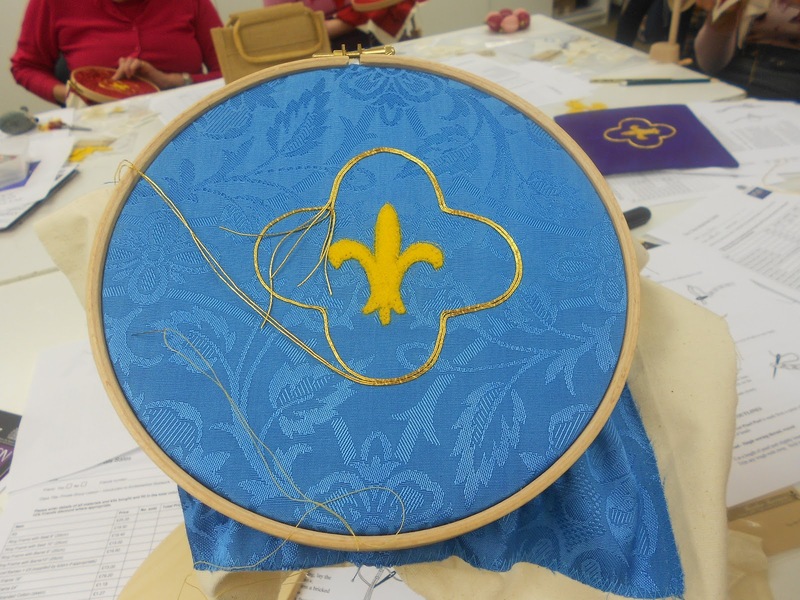 We are planning to hold further goldwork courses later in the year, when we will tackle different techniques. Watch this space!